The national question across the world has reasserted itself dramatically as capitalism slips further and further into decay. It is a key question for Marxists and mistakes on the National Question can pay a heavy political price. The CWI Summer School in Barcelona featured an important discussion on the National Question. Philip Stott from Socialist Party Scotland introduced the discussion and Danny Byrne from the International Secretariat replied. Philp led off by describing how we are entering into a new stage of the National Question since the crisis. This has been reflected in a renewed intensity of national conflicts, tensions and demands for autonomy. The CWI has continually pointed to the incapability of the bourgeoisie in this epoch to solve the national question. Their failure to deliver on democratic and national rights has left this task to the working class. Since the crisis the National Question has emerged in a major way in Scotland, Catalonia as well as other areas. Philip made the point that the prism of the national question, in the absence of a credible socialist alternative, has become reflective of class anger against a political establishment that has consistently served the interests of capital in opposition to the interests of the working class. If war and revolution are the biggest tests for Marxists then it is necessary for us to add dealing with the National Question to that list, not in an abstract and general way but in a concrete way that is connected to the living experiences and conditions of the working class. It has been 100 years since the Russian Revolution in 1917. The Bolsheviks took time to develop an approach on the National Question with the view of creating the maximum unity of the working class. This is the approach we take. We defend the right to self-determination including independence if that is the democratic desire of national peoples. It is however necessary for us to go further than this and apply a Marxist approach to developing our slogans and tactics relating to concrete circumstances and the consciousness of the working class. The emphasis of the CWI’s programme in Scotland has been adapted at different stages as the objective situation and consciousness has developed. In 1979 the CWI’s slogan was for a "Socialist Britain with autonomy for Scotland". Support for independence was at 7%. This reflected a situation where the existence of a broad “all-British” labour movement through which the working class could assert itself politically and industrially cut across support for independence. This would become increasingly undermined as capitalism slipped from crisis to crisis and the British Labour Party shifted dramatically in a rightward pro-capitalist direction. The slogan of a Socialist Britain quickly became a barrier to reaching working class and young people. In the early 1990s we modified our approach calling for a "Socialist Scotland in voluntary confederation with a Socialist England, Wales and Ireland" This slogan lasted five years such was the pace of development. In 1998 we advocated for the first time, an “Independent Socialist Scotland in a voluntary confederation with a Socialist England, Wales and Ireland". This change was in anticipation of the direction of travel. This perspective was proved correct with the 2014 Independence referendum. The referendum became a proxy battle for class anger, with mass meetings and rallies held as independence came to be seen by millions as a solution to neo liberalism. 1.6 million people voted for independence. There was an intense fear among the bourgeoisie that the referendum could be lost. ‘Project fear’ was launched by big business and senior representatives of capitalism such as Barrack Obama intervened to try and ensure a victory for the Union. Class anger was expressed through the medium of the ‘Indy Ref’. The Socialist Party Scotland (CWI) was able to reach radical layers of workers and youth and pose a socialist alternative to the pro-capitalist SNP and open up a discussion about what the nature of Scottish society should be. In the Spanish state, the Basque, Catalonian and Galician National Questions all feature, though in different ways. The central common thread is that the working-class must take the lead and shape the struggle for national liberation in its own class interests. The only solution is socialism. In Catalonia, this means struggle against austerity and privatisation as well as for the right to a referendum on independence, against the right-wing nationalist leaders in the Catalan government as well as against the PP. In order to achieve this, unity must be forged between Catalonian workers and those in the rest of the Spanish state in their common battles. Borja from Catalonia contributed to the discussion about the development of support for Catalonian independence. He said that the development of industry in Catalonia provoked migration from poor regions of the Spanish State. There was an intense hatred for the Franco regime and the political repression that accompanied it; the working-class in Catalonia where searching for a way to exercise their democratic right to decide their relationship with the rest of the Spanish state. Under pressure from below, the Catalan government has called another non-binding “referendum”, which has been declared illegal by the Rajoy government. The Bourgeois nationalist party (Convergencia, now called PdeCat) has ruled Catalonia almost uninterruptedly for 30 years. This has meant neo-liberalism, cuts and repression against immigrants. Borja made the point that at times the interests of the political representatives of capitalism can diverge from the interests of the system as a whole. This is the case in Catalonia. The Catalan bourgeoisie does not want independence. They are content to say that “Madrid robs us” and use this as a cover for their pro-cuts policies. They do not want an illegal referendum to take place but to not participate would undermine their credibility in the eyes of workers. 50% of Catalans support the right to hold a referendum, be it legally or illegally. There is revolutionary potential in the situation. 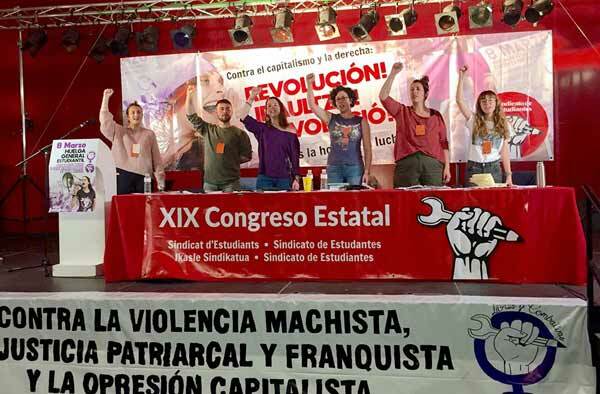 The Sindicato de Estudiantes (Student’s Union) is in a prime position to connect with masses of pro-independence youth by campaigning for the referendum to be held. Eloy made points around the Basque question and the difficulties accompanying it. He made points about ETA. ETA’s methods of individual terror managed to secure some successes in the 1970s such as the assassination of Franco’s Prime Minister. This coupled with the repression suffered in the Basque country caused layers of young people to turn to and enter ETA. As Marxists we oppose the methods of what is called “individual terror” for its futility as a method of struggle. The attack on one or two government ministers or economic targets does not challenge the system fundamentally. On the contrary, it is well within the power of capitalism to replace these individuals with relative ease. These methods provide an excuse to ramp up state repression and can prove counter-productive. 5 years ago ETA announced its ceasefire. The response of the PP government has been to declare it a trap. International mediators have observed the decommissioning of ETA’s weapons yet this has been ignored by the PP government. The demands of the pro-independence movement, such as the ending of the police occupation of the Basque country, resolution of the prison issues and repeal of the anti-terror laws have not been met. The PP government, as the political ancestors of the Franco dictatorship, wishes to use the spectre of ETA as an excuse to ramp up repressive measures. The 2012 ETA ceasefire was the same year two general strikes rocked the Spanish State. The radical Basque nationalist party increased its support and number of MPs drastically. They had an opportunity to carry the struggle further throughout the Spanish State, to build a movement against austerity linked to national rights. Instead they turned their back on the movement and sought to secure support from the Basque bourgeoisie and its party the PNV, the price of which was social peace. Podemos in effect won the 2016/16 election in the Basque country because of the rightward shift of the Basque nationalists and their correct, though abstract, defence of the right to self-determination. However, they have since ten centred their activities only in parliament, away from the struggle in the streets. The only force willing to break the social peace in the Basque Country has been the Student’s Union which organised historic mass demonstrations during its student general strike on 26 October. In the North of Ireland the working-class is divided. Over the years, the Socialist Party (CWI in Ireland) has had to adapt and update its programme as the situation progressed. While in Catalonia and Scotland we have supported independence referendums, we could not support a so-called “border poll” in Northern Ireland as is put forward by Sinn Fein and others at the moment. It would not resolve the question nor push forward the interests of the working-class, rather it would deepen division and stoke the flames of sectarian reaction. In the discussion Daniel Waldron from Northern Ireland made points about the North of Ireland. The Good Friday Agreement has resolved nothing. We have reached what one Tory politician described as an “acceptable level of violence” and sectarianism. It was an agreement which brought together the main representatives of the two blocs to administer capitalist rule. The promised “peace dividend” has not been delivered for working class people. Instead Stormont has served as the main instrument through which neo-liberal capitalism has asserted itself. Cuts, privatisation and unemployment have been the order of the day. Sectarian politicians walk a thin line between the stoking up of sectarian tensions and division whilst attempting to maintain Northern Ireland as “open for business”. This is an inherently volatile situation with tensions spilling over and outbursts of violence occurring. This was played out during the flag protests in 2012 which saw Sinn Fein and the DUP stoke up tensions over the removal of the Union Flag from Belfast City Hall provoking widespread protests and rioting which quickly escalated out of the control of the main parties. The recent election reflected a more intense polarisation towards Sinn Fein and the DUP. Stormont collapsed over the issue of a corruption scandal surrounding the Renewable Heating Incentive. This was seized upon by the main parties who shifted the ground away from class issues to issues of national and cultural identity issues: i.e. defence of the union or the strongest advocates for a united Ireland. The potential for a renewed conflict is inherent in the situation – not in the short or medium term but in the long term if a viable class alternative is not posed. The Socialist Workers’ Party, under the banner of People Before Profit made significant electoral breakthroughs in the previous elections. More recently, they have fallen victim to a swing to Sinn Fein. This was not coincidental. They have consistently based themselves only upon the consciousness of the Catholic working class and their slogans and demands have not accounted for the fears of the Protestants working class. Only a cross-community force basing itself upon the unity of the working-class, advocating a socialist program to the National Question in opposition to both unionism and nationalism is capable of delivering fundamental change. The dominant trend has been towards the breaking up of established entities while at the same time young people have an increasingly internationalist outlook. This is a very positive development but can reflect itself in a confused way at times. For example, many young people conflated their internationalism with support for the European Union in part as a reaction against the right wing nationalism of Nigel Farage and UKIP but without looking deeper into the neo-liberal DNA of the EU. The Brexit referendum has stirred sectarian tensions. There is a growing feeling amongst the Catholic working-class that their majority vote to remain in the EU has been overturned by the UK. The question of a hard border would be a real blow to the Catholic community who would feel this a serious step backwards and could serve to exasperate frustrations. This has been the focal point of Sinn Fein’s strategy looking to use catholic grievances to advance their position. The Protestant working class feels as though their position has been undermined. A “Border poll” once initiated would have to be re-run again within a seven-year period under the terms of the Good Friday agreement, increasing a feeling of insecurity. The implication of our slogan for a “Socialist Ireland” is that we emphasise socialism. Its implication is that we favour Irish unity but not in the crude way advanced by republicans. It is necessary for us to emphasise that we oppose the coercion of any community into a united Ireland or into the UK, and leave open the exact democratic formation that a socialist Ireland would take. The National Question is more complicated today than when Lenin wrote on the issue. Lenin and Marx focused on the neo-colonial world more so than the advanced capitalist world. Its emergence in the advanced capitalist world is a product of acute capitalist crisis and the delay in the socialist revolution. We have to utilise the method of the Bolsheviks and of Marx in laying the basis for working-class unity. We must constantly point to the dead end of capitalism in being unable to resolve these issues and advocate the socialist solution. This means in practice constant discussion and reconsideration of the slogans we adopt and the tactics we put forward. To change a slogan or tactic without being open and explanatory as to why the change has occurred is dishonest and alien to the Marxist method. A correct approach on the National Question is essential for world revolution and socialism; only a united working-class can end national oppression and division permanently. Danny Byrne summed up the discussion, covering questions asked about Black Nationalism in the US and trade unions and the National Question. Trotsky wrote on the question of Black Nationalism. He did not advocate for separation but argued it was necessary to leave open the possibility that a mass demand for a black state could emerge. The situation did not develop like that instead at the height of the black liberation struggle in recent decades there has been a tendency to unite with the white working class. On the question of Trade Unions it is very true that the Trade Union movement as the organised expression of the working-class has a key role to play. In difficult situations they can be an oasis of class unity. For example in Northern Ireland the Trade Union movement had the potential to play a leading role in opposing sectarianism and giving leadership to the civil rights movement. At the outbreak of the troubles we raised the slogan “for a trade union defence force” to hold back the tide of sectarianism and prevent sectarian attacks. Unfortunately the Trade Union leaders abdicated this responsibility and allowed sectarians to fill the vacuum. The recent British Elections highlighted the price that can be paid for a mistaken approach on the National Question. Corbyn has made a series of mistakes in Scotland in terms of campaigning against independence and a referendum. The Corbynista movement generally in Scotland has been smaller than in England. The only place where Owen Smith beat Corbyn was in Scotland in the last leadership contest, reflective of the Blairite nature of the Scottish Labour Party in no small part due to Corbyn’s mistaken approach on Scotland where he went against the national aspirations of millions of Scottish working-class and young people. The Spanish State is a classic example of the two sided nature of the national questions. There, the reactionary side of the national question in its potential to divide and distract from the class struggle, as well as its revolutionary potential in the development of mass movements against national oppression which quickly come up against the obstacle of capitalist legality and rule, are clearly illustrated. It has led to an explosive dynamic in the Spanish state. British Imperialism has long been of the view that it would prefer to withdraw militarily from Ireland preferring instead to dominant the country economically. The Spanish Bourgeois would not even contemplate such an outcome. The PP has Francoist tendencies written into its DNA. The economic position that Catalonia and the Basque country hold within the Spanish state in has meant that Spanish Capitalism is unable to satisfy the national aspirations of the Basques and Catalans, unwilling to contemplate economic “dismemberment”. The struggle for basic democratic rights will bring the working class into immediate conflict with Spanish Capitalism, which will lead many to the conclusion that a revolutionary break with the system is necessary. The CWI has made a genuine contribution to Marxist analysis on the National Question. In situations of deep division of the working class, such as Northern Ireland, Israel/Palestine etc. we have established roots and a presence in both communities because of our method and approach. This is a great vindication of the validity and correctness of the CWI’s approach.